What is an ESA (Emotional Support Animal)? An ESA (Emotional Support Animal) is a US legal term for an animal that provides therapeutic benefit to its owner through companionship and affection. Emotional support animals do not need to be trained to ameliorate disability as psychiatric service dogs are. They require only as much training as an ordinary pet requires in order to live peacefully among humans without being a nuisance or a danger to others. According the the Fair Housing Amendment Act, a landlord should not discriminate against any individual who has documentation from a physician illustrating their need for an emotional support animal in housing. Housing Providers must provide a “reasonable accommodation” for persons with disabilities under both the Fair Housing Act and section 504 of the Rehabilitation Act of 1974, according to the US department of Housing and Urban Development. There are many instances where lawyers have sued and won cases against landlords for discriminating against ESA dogs. Most landlords will reluctantly agree to allow the pet, even after giving you grief at first. The ESA documentation The DOGtor provides you will be sufficient for your housing needs. The Fair Housing Amendment Act of 1988 establishes a procedure for modifying “no pets” policies in most types of housing to permit a person with a disability to keep an animal for emotional support. In housing that allows pets but charges supplemental rent or deposits for them, these fees must be waived. The ESA’s owner can be charged for actual damage done by the animal, but they may not require the applicant to pay a fee or a security deposit in order to keep the animal. The U.S. Department of Housing and Urban Development’s Office of Fair Housing and Equal Opportunity investigates complaints from the public alleging denials of reasonable accommodation requests to live with assistance animals. What is the difference between an emotional support animal and a service dog? An Emotional Support Animal is prescribed to individuals with anxiety and depression most of the time. This animal can only accompany a patient in their home or apartment. 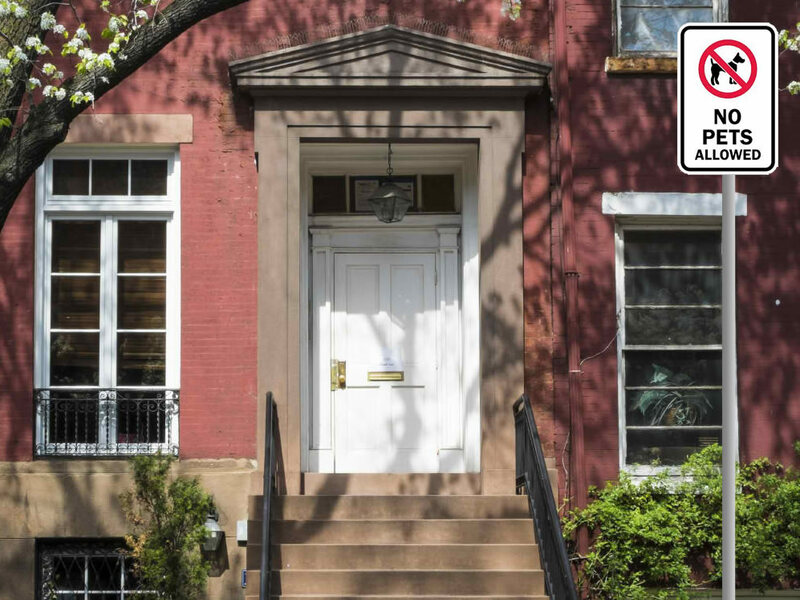 This includes apartments or homes that are not “pet-friendly.” ESA dogs are allowed under the Federal Housing Amendment Act to be made exceptions to strict no-pet policies. 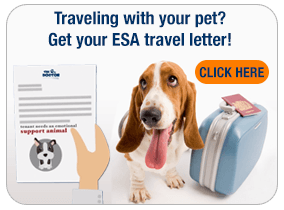 ESA dogs may also be allowed on commercial air flights, provided that they present their ESA letter well in advance of departing on the aircraft. There is quite a big difference between a service dog and an emotional support animal. First and foremost, a service dog is prescribed by a physician to assist heavily disabled patients, usually as a “seeing eye” companion for the blind. A service dog can also be taken anywhere, such as a bank, an airplane, a grocery store, and even court! ESA dogs are not afforded this privilege. People who want a pet companion for travel on trains or airplanes, or want to have them be allowed at their home or apartment, despite their landlord or property managers “No Pet” policy will be ideal candidates for emotional support animals, not service dogs. Can I bring my emotional support animal in the cabin of a commercial aircraft? Yes, but it is advised that you check with your airline prior to travel. However, The Air Carrier Access Act does establish a procedure for modifying pet policies on aircraft to permit a person with a disability to travel with a prescribed emotional support animal so long as they have appropriate documentation and the animal is not a danger to others and does not interfere with others (through unwanted attention, barking, inappropriate toileting, etc.). Can I take my emotional support animal into restaurants or other public places? No. Emotional support animals are only intended for in home companionship, whereas service dogs are given unique access to both private and public establishments. Does having an ESA exempt me from pet deposits in housing? Yes. Having an emotional support animal exempts you from all pet deposits, regardless of whether the facility allow pets or not. 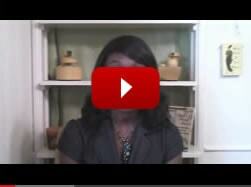 If a landlord is asking you to put down a deposit for your ESA, he is breaking the law! 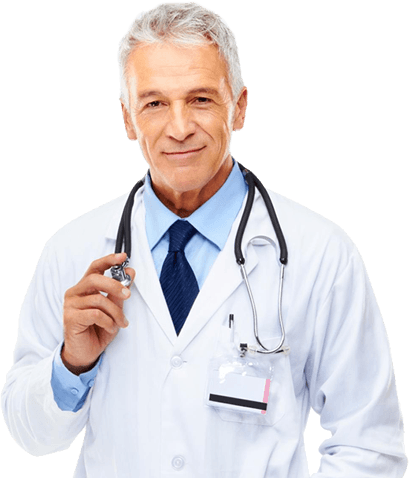 Can my primary care physician write me an ESA prescription? In theory, any patient is free to consult with their primary care physician regarding their need for an emotional support animal. However, 9 times out of 10, patients will run into a doctor who does not believe in the therapeutic benefits of having a dog as part of their treatment for their insomnia, stress, or anxiety, just to name a few. These physicians are more likely to prescribe you pharmaceutical medications. Furthermore, it’s important to keep in mind that these doctors are going to require some sort of a payment up front, usually a copay, and most of the time, you will get denied. The DOGtor exists because all of our physicians see the therapeutic benefits of animal companionship to help cope with everyday conditions such as depression, insomnia or stress. Not to mention, when you visit The DOGtor, you only pay if you are approved, so there is a zero risk for both your time and your money. Is The DOGtor a licensed Medical Professional? Absolutely! Yes, our network of evaluating practitioners are either licensed medical doctors or licensed clinical psychotherapists. Will my ESA letter come from this website or from the prescribing medical professional? Your ESA letter will be written on the letterhead of the office of the prescribing physician or pscychotherapist! It will not come from TheDogtor.net. How will my landlord or property manager be able to verify my letter? Your landlord or property manager can verify your letter by calling the verification number that is included on the prescribing physician’s letterhead. 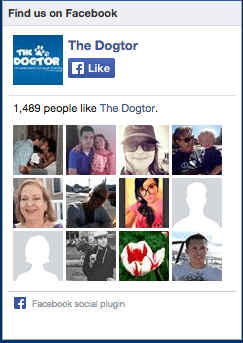 This is the verification phone number of the doctor that issues your prescription, not TheDOGtor.net’s number. Your landlord will simply leave a message with the first and last name of the patient he is trying to verify and someone will contact them to verify your letter. Unfortunately due to the difficult nature of being reimbursed by insurance companies for emotional support animal exams, we regret that we are not able to accept medical insurance at this time. In light of this, we have tried our best to make the approval process as easy and as affordable as possible. Each member may choose any of the plans offered. The “Care Plan” offers a 1 year housing only letter that must be renewed every 12 months from the date the letter was issued. This is the most affordable housing plan. 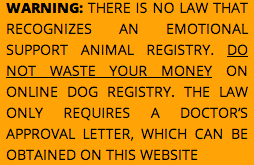 It only costs $159 for the evaluation and emotional support animal documentation. The most cost-effective letter, however, is the “Compassion Plan,” which is $199 and the ESA documentation has no expiration. It is by far the most popular plan chosen by our patients due to the fact that once they get their documentation, they will be able to live in peace with their pet, and travel with their pet, without having to retake the exam. Compassion Plan members will simply email in to the medical professional who prescribed the ESA (as well as this site) every year to give updates about how the ESA therapy is working. If you believe the therapy is working and would like to update it, then a new letter will be issued at a significantly discounted rate. This pertains to the airlines since they require a letter that is not older than one year from the date of travel. The “Travel Plan” is $149 and is an ESA letter given for air travel only and does not include an ESA exemption for housing. We accept the following payment types: Discover, Visa, Mastercard, and American Express. We are also proud to say that we can now accept Bitcoin! Are you guys on Facebook or Twitter? Yes! We are on Facebook and Twitter. Please like and Follow us! Why have I never heard about this type of service before? Believe it or not, Emotional Support Animals have been legally recognized by the US government since the late 1980′s. Up until recently, ESA’s have been flying under the radar due to a lack of knowledge of the Fair Housing Amendment Act. 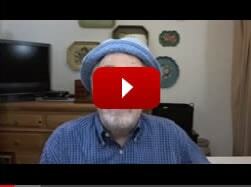 Over the last four years, the media has really put ESA’s in the National spotlight with many articles educating people on the merits of ESA’s. 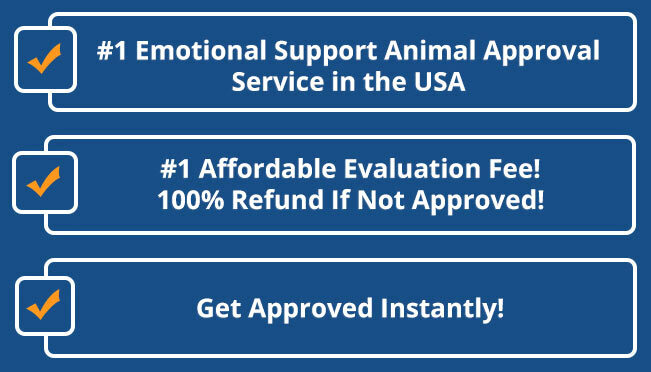 The DOGtor is the first mainstream service in the history of the United States to provide Emotional Support evaluation to the general public. With a countless number of satisfied ESA owners, The DOGtor is now growing to be a nationally recognized brand.